How does one organise arts education in a multi-ethnic society? Whose culture should be taught? What should be considered in drawing up a national curriculum for music? The Finnish-Nepalese-Israeli project Global Visions Through Mobilizing Networks is contributing to the development of music education in Nepal. Sandwiched between two Asian giants, China and India, Nepal is a country with more than 100 ethnic groups, each with its own language and culture. Nepal is multicultural with a vengeance, and this is apparent in all branches of the arts in the country – music, dance, visual arts and crafts. Finns have been involved in developing education in Nepal for a long time, both through government efforts and through various NGOs. So far, arts education in Nepal has been largely up to the initiative of individual interested teachers or else available as elective subjects for a fee. In autumn 2013, a small group of Finns found themselves at the airport waiting for a flight to Katmandu. 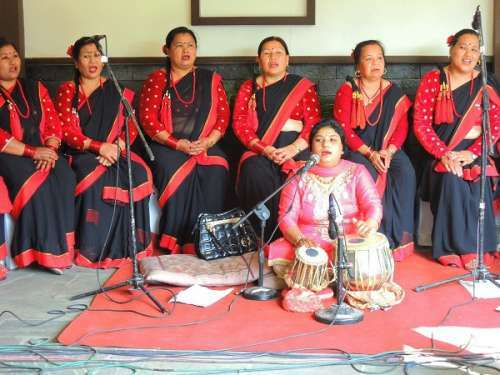 The Nepalese Ministry of Education had just added music to the national core curriculum but then had realised that, in the absence of a music teacher training programme, there were no qualified music teachers in the entire country. The Nepal Music Centre, a private music institute with a fresh mandate from the Ministry of Education for setting up just such a training programme, had contacted music educators at the Sibelius Academy of the University of the Arts Helsinki. They had accepted the challenge, had been granted funding out of the cultural exchange programme of the Finnish Ministry for Foreign Affairs and were now en route to view the situation on the ground. The group on this first trip comprised Heidi Westerlund, Professor of Music Education at the Sibelius Academy; researcher Heidi Partti; lecturers Soili Perkiö and Vilma Timonen; and the present writer. The old town of Katmandu. The purpose of this first trip was to survey the current situation of music teaching in Nepal and available partners and to outline potential future cooperation. 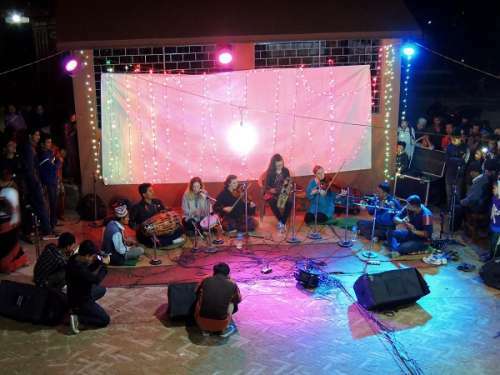 Workshops were held with the teachers and students at the Nepal Music Centre, and meetings were organised with local music professionals to gain an overview of the operating environment. At the workshops, we met teachers and engaged them in practical exercises to gauge their capabilities for adopting various pedagogical methods in common use in Finnish music teacher training, and we explored local music education goals. It became clear to the Finns during this trip that in the multi-ethnic context of Nepalese society the development of music education and music teacher training would be challenging. Music is traditionally an activity at the lower end of the social scale, and there is scarcely any systematic teaching in the various traditional genres of music. Musical competence is transferred from generation to generation through the master-and-apprentice model rather than at official institutions. Having said that, we should note that there was already music education in place in the country: music is a subject at the two universities in Nepal. 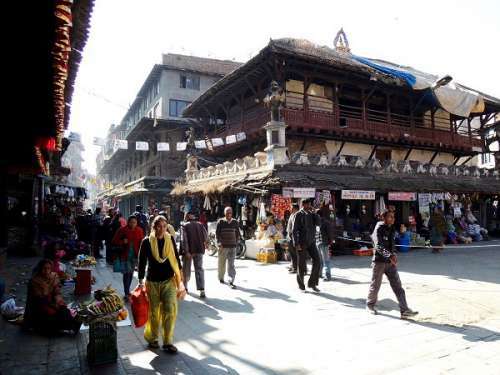 However, the teaching there mainly focuses on Hindustani music and a smattering of local traditions, generally that of the Newar, who have a strong presence in the Katmandu valley. In addition to the universities, there are hundreds of private music schools that mainly teach popular music; but there is no national music education system with progression in skill levels. This is not to say that Nepal is a stagnated cultural backwater, even though concern is often voiced about the survival of local cultures amidst the pressures of the modern era. The cultural focus of Nepal is the Katmandu valley, where many kinds of music may be heard. Popular music is generally doing very well: there is a thriving local rock and pop industry. Music is on the radio all the time and is also used in the myriad of cultural rituals celebrated throughout the country. Nepal is a melting pot for interesting and original musical fusion styles as musicians mix and match everything they have heard and learned, just as in any other place in the world. The ‘Housewives Choir’ from Manamaiju village performing at the CDIME conference in Katmandu on 31 March 2017. After this first trip, the Sibelius Academy working group distilled a more concrete approach to cooperation for the purpose of improving music education in Nepal, as their understanding of the context and the needs of music teacher training in the country grew. 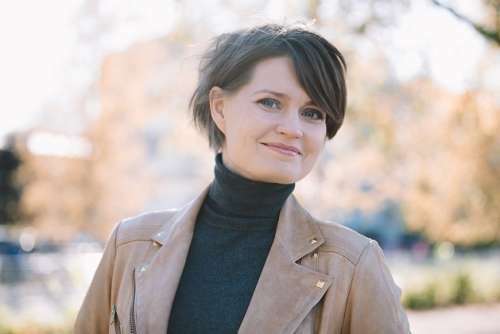 The project soon expanded into a research project that acquired the title ‘Global Visions Through Mobilizing Networks’ and was provided funding by the Academy of Finland for the period 2015–2019. The project was joined by Israel, which has its own specific cultural issues in music teacher training. The Global Visions project is about developing multicultural music education between the Sibelius Academy in Finland, the Nepal Music Centre and the Levinsky College of Education in Israel. The project involves a dozen researchers and includes research cooperation, network building, enabling of dialogue and development of music education with a global perspective. The project focuses on peer learning and the understanding and leveraging of musical diversity in music teacher training. Nepal, with its recently defined goal of creating a music teacher training system, is a key component in the project. A broader goal is generally to train music teachers capable of operating in increasingly multicultural environments worldwide. How the project works on the ground in Nepal is that researchers build local and international networks by immersing themselves on the local music scene and in local music education, helping to build up infrastructure and to create a vision of the future of music education in the country and how to attain it. Pedagogical solutions are sought through joint efforts and research data are collected while analysing and exploring the challenges encountered in the training and how to improve it. All of the data collected will be exploited on a global scale for developing music teacher training. Finnish and Nepalese musicians performing at the final concert of the project in Manamaiju village on 28 March 2017. I interviewed Heidi Partti, a researcher in the Global Visions project, during the Cultural Diversity in Music Education conference in Katmandu in April 2017. It was initially difficult to find common ground between the Finnish and Nepalese conceptions of teaching. “Finland has a strong ‘researching teacher’ tradition. The idea is that the teacher does not simply reproduce the curriculum as given but is an independent expert who is able to refine his or her teaching by reflection and by reviewing research in the field,” says Partti. Nepal, on the other hand, is a more hierarchical society, where learning has largely relied on repetition and imitating the teacher. Also, teachers are not high on the social ladder, similarly to musicians. Nevertheless, musicians and music teachers there are competent professionals in their respective fields, although the quality of their pedagogical skills varies. “The strength of the Finnish system is teacher autonomy. Teachers are trusted. The weakest learning results are recorded in countries with authoritarian systems where no such trust exists,” says Partti. The Global Visions project aims not only to gain a wide body of research data but also to help local teachers demonstrate their professional expertise and to offer pedagogical tools for use in teaching. However, it is important to note that this is not about Finns going around pasting their own system on top of local customs; everything is done in cooperation and mutual understanding with local music professionals. The project has involved bringing teachers together to think about what should be done about music education in Nepal and how the desired targets could be attained. Four musician-teachers from Nepal – Kushal Karki, Iman Shah, Rizu Tuladhar and John Shreshtha – have been studying music education at the Sibelius Academy, and their studies have involved exploring how to develop music curricula in Nepal. This is an important vehicle for outlining the aforementioned targets, and researchers in the Global Visions project are providing support for these studies through teaching, guidance and advice, ranging from language assistance to theoretical issues and how to introduce pedagogical methods into their practical work. So how could the research data gained in Nepal be applied in the Finnish context, or indeed globally? Heidi Partti notes that one of the principal goals of the project was to prompt discussion about diversity in education and to help people react to changing contexts worldwide. More studies in intercultural skills are being added to Finnish music teacher training in the current curriculum reform (see also the FMQ article Composing is for everyone), and an international project such as this one has the potential to collect valuable experiences and good practices applicable in such studies. There are shared issues in music education in Nepal and in Finland, such as where to draw the line between preserving and renewing tradition, and which of the two should be given more weight. Another major question is whose music should be taught in the classroom and who decides this. Diversity in music education does not mean just musical diversity, which could be easily addressed by adding a few courses in ‘world music’ to the music teacher training curriculum. “There are different kinds of learners, students from different cultural backgrounds, representatives of various religions and sexual orientations, diversity in all shapes and sizes, and a music teacher must be able to deal with all of this,” says Partti. As an example of developments growing out of the Global Visions project, we may mention a network established by Nepalese women teachers at their own initiative. This testifies not only to empowerment and self-awareness of professional competence and the ambition to improve themselves but also to an erosion of social hierarchies. Multiculturalism is a fact of life, and the challenge is how to deal with it and take it into account in teaching. “Diversity is not a problem to be solved. It’s a huge strength!” concludes Partti.